KPMG is one of the world’s leading auditing and business advisory networks. In this presentation Andrea Sartori, Head of KPMG’s Global Sports Practice, will discuss the results from KPMG’s annual Football Club’s Valuation Report: The European Elite 2016. The Valuation Report provides an enterprise value guide for the most prominent 32 European football clubs. Andrea will share insights and lead a discussion on what the selection criteria and valuation drivers were used for the analysis, as well as showcasing the new KPMG Football Benchmark Platform and explaining what some of the recent acquisitions of European football clubs can tell us about the business of buying and selling clubs. Andrea leads the Global Sports Practice at KPMG. His main areas of expertise include business planning, valuation, transaction, project financing, market and financial feasibility studies and project management of complex advisory assignments in the sport and leisure industries. Outside of these industries, Andrea has extensive experience with special classes of real estate such as stadia, sport arenas, golf resorts, convention centres, hotels, marinas and theme parks. During his career with KPMG, Andrea has performed over 300 assignments in more than 30 countries globally. Some of Andrea’s major clients in recent years include various national and international football governing bodies, several football associations and clubs, investors, developers, as well a large number of sovereign wealth funds from the Middle East. Beside his broad experience in football, Andrea has also provided advice to a range of stakeholders in golf, alpine and motor sports. Andrea is also the founder of footballbenchmark.com, the business intelligence tool of KPMG which democratises and consolidates financial and operational data of more than 150 European football clubs. 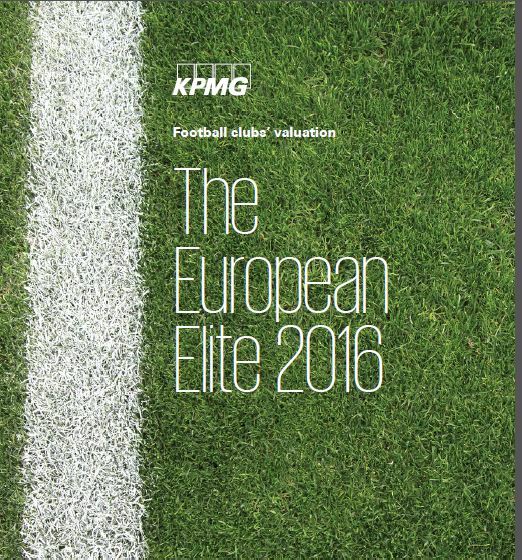 KPMG (2016) Football Clubs’ valuation – The European Elite.